Inventory We are a resale marketplace, not a box office or venue. Ticket prices may exceed face value. This site is not owned by Austin 360 Amphitheatre . 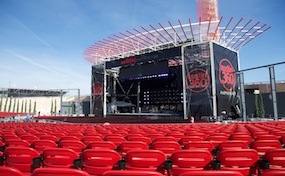 The Austin 360 Amphitheater opened in 2013 to be in the primary outdoor concert venue in the Austin Metro area. The 360 Amphitheater provides seating for 15,000 with approximately 6,500 seats. The open air venue is located on the Circuit of the Americas F-1 racing facility. Austin360 Amphitheater tickets first notable concert will be Kenny Chesney. Austin360 Amphitheater was the winner of Pollstar’s “Best New Major Concert Venue” award for 2013. This premier open-air stage has already hosted Jimmy Buffett, Dave Matthews Band, KISS, Nine Inch Nails, Kanye West, Kenny Chesney, Zac Brown Band, Mumford & Sons, Maroon 5, Blake Shelton, Miranda Lambert, Pitbull, Train, One Republic, Drake, and Lil’ Wayne all in the few years it has been open. In addition to concerts, the grounds around the amphitheater are frequently used for day long festivals, sporting events, and even barbeques! AmphitheaterAustin.com is a privately owned and operated company that operates completely in the online retail of the secondary ticket market. We are not associated with any official website, box office, venue, or primary supplier. All tickets are on the resale market with pricing above or below face value. These prices will fluctuate quickly with demand. To order tickets to all 360 Amphitheater Austin events simply follow the steps online through checkout or call our operators for further assistance.